How much does it cost to travel to the Maldives? How much money will you need in the Maldives? MVR922 ($60) is the average daily price for traveling in the Maldives. The average price of food for one day is MVR207 ($13). The average price of a hotel for a couple is MVR1,292 ($84). Additional pricing is in the table below. These average travel prices have been collected from other travelers to help you plan your own travel budget. How expensive is the Maldives? The Maldives is a tropical nation located in the Indian Ocean, consisting of ring-like coral islands or atolls. It is a popular destination for honeymooners, as well as for visitors interested in scuba diving or snorkeling explorations along the unique reef ecosystem. The Maldives consist of 20 administrative atoll groups, only ten of which are open to tourism. The naming of these groups are complex as they have traditional names as well as code names that are easier to remember and used most often by tourists. The 10 that are open to tourism include Lhaviyani (Faadhihpolhu), Raa (Maalhosmadulu Uthuruburi), Baa (Maalhosmadulu Dhekunuburi), Kaafu (North and South Male Atoll), Alifu (Ari), Vaavu (Felidhu), Meemu (Mulak), Faafu (Nilandhe Atholhu Uthuruburi), Dhaalu (Nilandhe Atholhu Dhekunuburi), and Seenu (Addu). The code names, most used by the general public, are listed in bold. Of these ten, Kaafu is the most popular and most developed with tourism. It is home to the capital (Male), the airport island (Hulhule), and most Maldivian resorts. The second most popular group of atolls is Alifu, located just to the west of Kaafu. Here there are many additional resorts that can be reached by seaplane in 20-30 minutes, or speed boats, which take several hours. Seenu is the southernmost atoll group, which is home to Gan International Airport, and has a series of four islands connected by a causeway. The second largest city in the Maldives is also located here. The remaining atoll groups, which are not open to tourists, consist of Gaafu Alifu, Gaafu Dhaalu, Gnaviyani, Haa Alifu, Haa Dhaalu, Laamu, Nyavinani, Seenu, Shaviyani, and Thaa. Many people flock to the Maldives to enjoy the serenity of their own personal water bungalow at one of the main resort destinations. The next most popular activities are scuba diving and snorkeling. Since the islands are actually coral reefs, located far away from any mainland, the water is crystal clear and the underwater wildlife is abundant. Prices for diving excursions vary from resort to resort, but generally can range between $50-$100 USD, depending on whether or not you have your own gear, boat usage, guides, etc. Surfing is another popular activity during a visit to the Maldives. The best period for surfing here is between March and October, with the biggest waves occurring in June, July, and August. 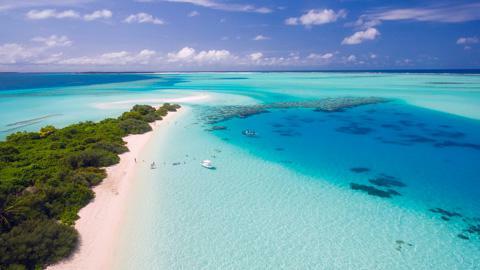 The unique setting of the Maldives' turquoise waters has become a draw for surfers, divers, snorkelers, swimmers, sunbathers, and honeymooners alike. While Kaafu and Alifu are the most popular atolls for tourists seeking out a tranquil bungalow escape, there are several other locations throughout the tropical nation that are frequented for different reasons. Hanifaru Bay, for example, in the Baa atoll is one of the Maldives' most famous marine sites. Especially notable is one of the largest seasonal gatherings of manta rays in the world. Whale sharks are also seen seasonally, especially during monsoon when many species gather to feed on plankton that have washed into the lagoon. Another noteworthy site within Baa is the Blue Hole, which is very popular with snorkelers and scuba divers, who have the opportunity to experience a coral-lined underwater chimney that gradually narrows from 22 meters to seven meters. As a whole, the Baa atoll is an UNESCO Biosphere Reserve, meaning its waters are protected, which has allowed for an abundance of more than 200 species of coral and over 1,000 species of reef fish.